Guess what? 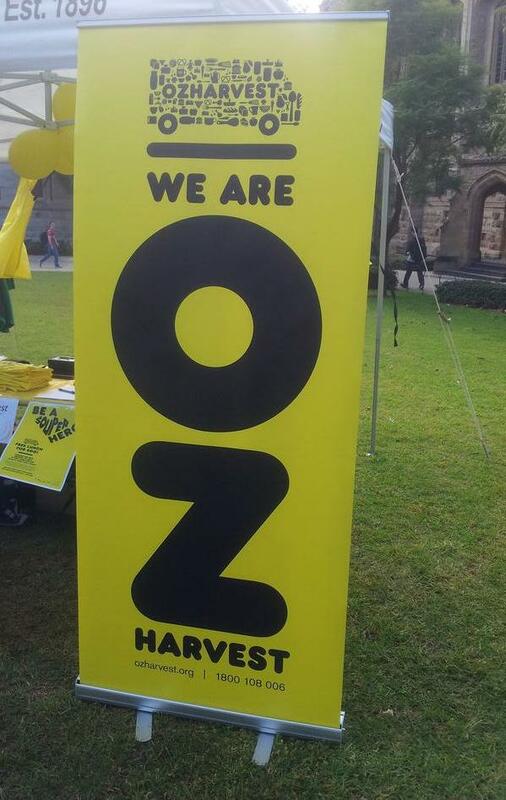 I spotted the OzHarvest Team at The University of Adelaide today! While on campus to do some paperwork, I came across the people of the team that I have been wanting to meet for a long time. 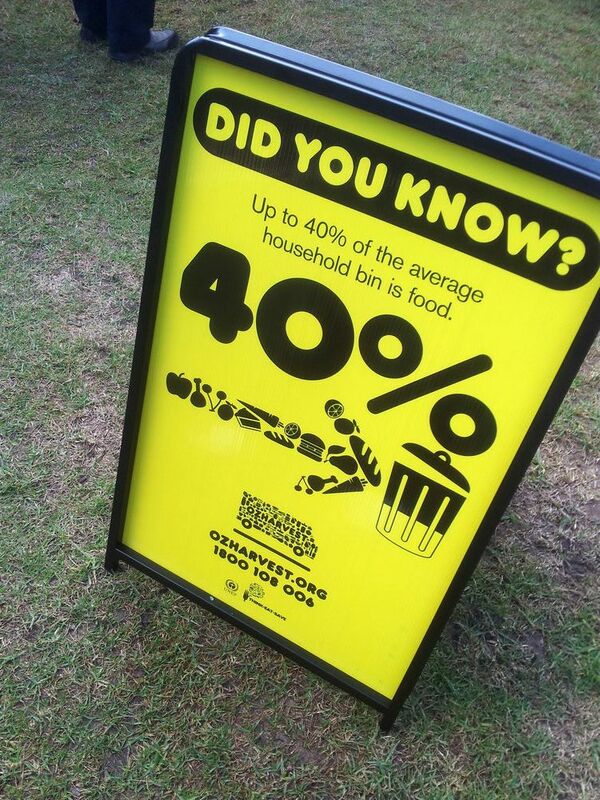 If you are not aware of food wastage, you may want to ask who/what is OzHarvest? Right, but it’s okay. I wasn’t aware of them until 8 months ago when I saw Callum Hann was cooking for them. That’s the positive side becoming a celebrity chef, isn’t it? However, when I looked up in depth content of OZHarvest, I was surprised with the amount of efforts these people put into our community. OzHarvest is a charity organisation aiming to rescue excess food that would otherwise be discarded/wasted. This excess is then donated/distributed in the form of cooked meals to charities to help vulnerable in Sydney, Brisbane, Adelaide and New Castle. Established in 2004 nationally and operated since January 2011 in Adelaide, the SA team is distributing 30000 meals per month to many SA charities. Of course, this stat would not be reached without the help from volunteers and donations from various markets and organisations, such as The Central Market and Adelaide Farmers Market. People may want to ask that, and that’s quite normal if you do, is food wastage a big deal? Yes, it is! It is now one of the top issues across the world. Every year, there has been around 40% of the total world food production which is wasted and discarded. Isn’t this serious?! What’s even more serious is the world hunger and the clear classification of social classes. This isn’t so obvious here in Australia but in China and other developing countries, this problem is more serious than ever. Anyway, they have their own problems to worry at the moment and let’s go back to the topic. 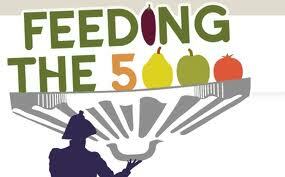 Feeding the 5000. Feeding the 5000 was a program run by OzHarvest and was held in Sydney, Brisbane and Adelaide from 12pm to 2pm today (29/07/13). As the official Australian partner of the United Nation Environmental Programme, Think, Eat, Save – Reduce Your Footprint campaign, the program provides free healthy and delicious soup made from rescued food produces to 5000 Australians at the same time and the target for Adelaide was 500. 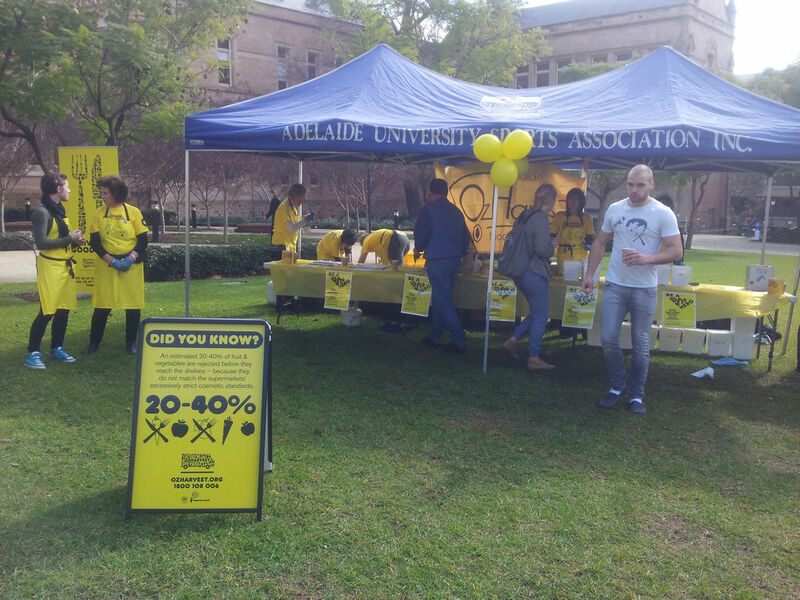 The event was held at North Tce campus of Adelaide Uni, which donated 5786 Kg of wasted food in their first year’s involvement with OzHarvest. Around 12pm, I walked from UniSA to Adelaide Uni and saw this big crowd of people lining up to get a taste of their free lunch. How great! During this event, I met my fellow blogger, Joanne, from What’s on the List, a passionate home cook trying to inspire people with her creations and a volunteer to cook for OzHarvest through Yelp. We exchanged our ideas towards many different issues in the “food” topic as well as issues of wordpress blogs. I also came across Hayley, who I just followed on Twitter last night! How wonderful is that and I love to meet people offline too. 😀 From our short 10mins conversation, I can definitely see her passion in rescuing food and in helping the community and charities. Unfortunately, I had too much for lunch before heading there and did not have enough space to taste the yummy looking soup but I am sure it tasted great as many students enjoyed them. I even heard students talking about the event and the pumpkin soup in the afternoon when I was down River Torrens to meet someone. Wow, what good influences this fantastic team has brought to Adelaide! As many of my readers know, I do care about food wastage in the world as well but on a different perspective. The OzHarvest focuses on saving waste food that will otherwise become landfills but I am more into the actual wastage during food production. Cheap cuts, offals, plants, leaves and even seafood that the Western world does not normally eat. As I’ve discussed in my previous posts, these food items can all be converted to delicious dishes if they are cooked the correct way. Otherwise, we can easily distribute these food items either to charities or to third world countries at reasonable prices to help reducing world hunger rather than dumping them or making pet food. Having said that I remembered a case in the UK where mitten crab has really become a problem because they destroy the domestic freshwater system and eat local species. We don’t have these crabs in Australia at the moment thanks to our strict quarantine requirements. Anyway, the UK government spend so much money to kill these crabs. What the UK people do not know is that these trouble making crabs are priced at AUD$30-40 each at least in China. People spend a huge fortune to savour one of these little creatures. So, here is the solution, pack these crabs up and export to China. 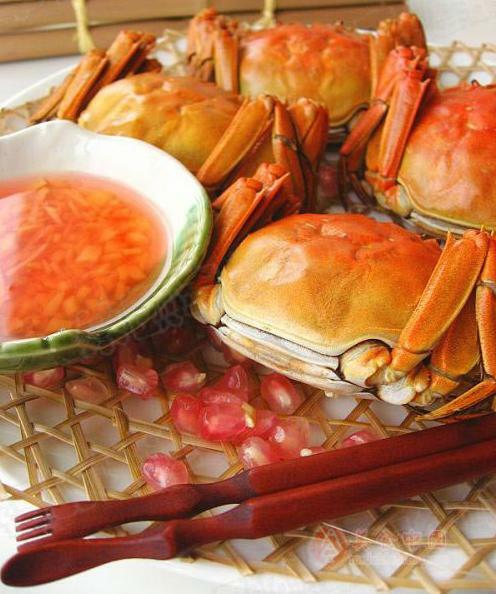 In this way, both world benefit and the price of these crabs will be down in China while the problem in the UK will be solved and at the end of the day, no edible food is wasted at all because a problem is turned into benefits. Oh, well, I shouldn’t spend so much time talking about something not so relative to the topic of this post. You must be tired now after reading a such long story, but before turning away and closing the browser, make sure to check out the fabulous works that OzHarvest people have done and to support our proud South Australian/Australian community to fight against food waste! The next post will be a easy but so delicious recipe and a product review on mussels. – Steamed Mussel Provincal using SA produced Kinkawooka mussels. Stay tuned! Good photos and introduction for the world food waste! However, I do wonder how they made the soup. Are those donated ingredients fresh and edible? Are they clean and meet nutritional info? 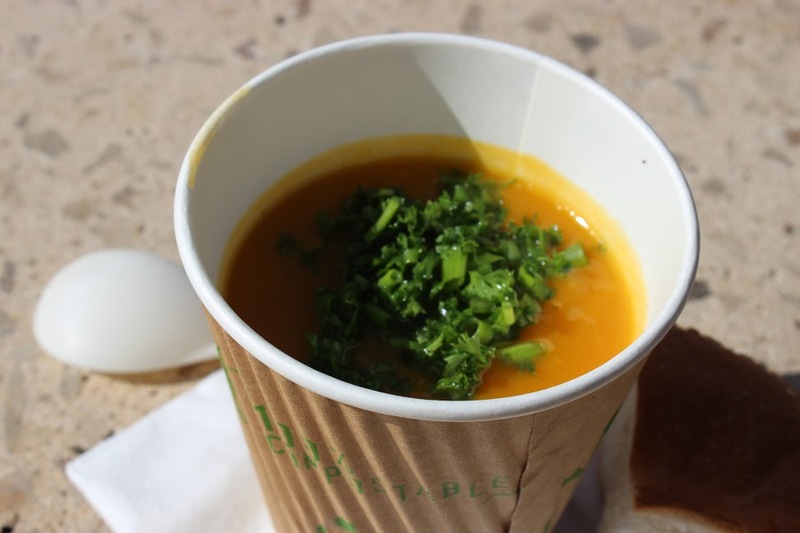 The soup served by OzHarvest was 100% made from rescued food – food that otherwise would have been binned. This was a prerequisite to be part of the UN event, but as rescuing food is what we do, we had no problem making this happen. Our Brisbane team went out to supermarkets on the Saturday and found enough vegetables ready to be binned to make 300Litres of soup. Supermarkets have a ‘shelf date’ as well as a ‘best before date’ which says that they must remove stock from shelves after a certain amount of time, regardless of its condition. The shelf date for potatoes is often less than a week (my potatoes at home last for months in a cool, dry space). Another example is that pre-packaged fruit or veges may have one bruised or split item on top of the pack that needs to be removed but the rest underneath are in prime condition. Even sadder is the produce that doesn’t look perfect (wonky carrots, apples or potatoes with lumps and bumps) that doesn’t even make it to the supermarkets. Usually this produce ends up in the bin (or slightly better, as feed for animals). Mel from our Brissy office is absolutely spot on with her response. Us OzHarvester’s are very passionate about what we do! Our Feeding the 5000 in Adelaide used vegies that were rescued from the Adelaide Central Markets, Adelaide Farmers Markets, Skala Bakery Bread, Keane’s Organics, Four Seasons Fresh Produce, Regency Tafe and more – all collected by our trucks and volunteers throughout last week. This is all produce that either wasn’t sold in time, slightly damaged or surplus to the requirements of that business – as an example we got some huge pumpkins that were damaged just on one corner so we could cut around them and make an awesome pumpkin soup! Feeding the 5000 was a great way for us to practically demonstrate how delicious and nutritious this rescued food is, and why it should never go in the bin. Thanks for asking the question so we can clarify for everyone who’s wondering! Thanks Hayley for the clarification! The event was surely very successful across the national and I’ve read some blog reviews about them. Through events like the F5K and/or cooking demo, people/students should be aware the issue more and the future leaders in the area of “food waste” may just be anyone of them! Great work! Always look forward to a mussel recipe and I love the kinkawooka mussels! G’day! 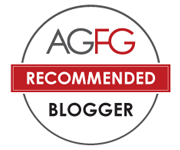 Great post in highlighting the event and food wastage, Xin, true! Great awareness for all, HOW we can all help minimize food wastage and what we all can do too! I assume so Joanne! If the leaves are deep fried, it may event taste good~~ I tried deep fried parsley and oh, it was such a beauty! Thanks Xin for sharing the experience. We went down to the Sydney event and I pretty much enjoyed the crumble! So tasty! It had good educational effects and our kids learnt a lot! Thanks OzHarvest! Thanks for the great article Joanne. It was nice to meet you yesterday at the OZ Harvest Soup Day. Regards, Belinda. Hi Xin, I thought Joanne was a very nice and interesting lady. Her article was great too! She writes really well. Enjoyable reading!